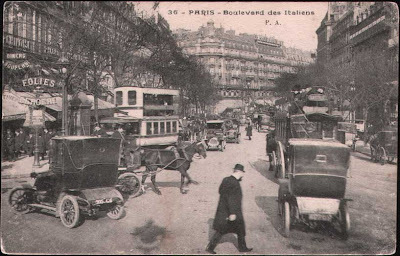 If the roads of Paris today seem dangerous, they are not a patch on the busy thoroughfares of the city at the beginning of the 20th century. 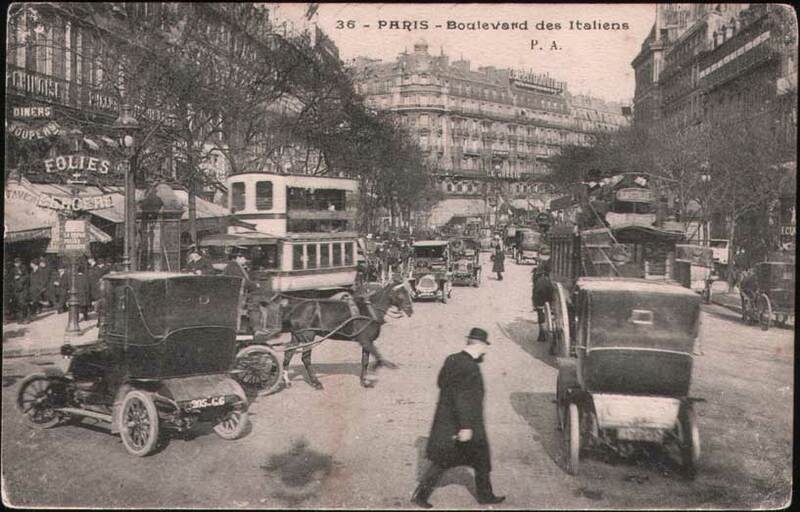 The freshly-created Haussmannian boulevards and avenues were thick with horses, trams and omnibuses, as well as the new-fangled automobiles, with predictably chaotic consequences on occasion. Reported on April Fool's day 1905, this particular story is perhaps symbolic of the wild streets of the city at the time. Titled 'A horse bolts', it describes an incident that took place on the Rue de Courcelles the previous day. A fiacre (hansom cab) was stationed on the road at two-thirty in the afternoon when a car went rumbling past. Startled by the noise, the horse bolted, creating a scene that wouldn't have looked out of place in a Keystone cops film. 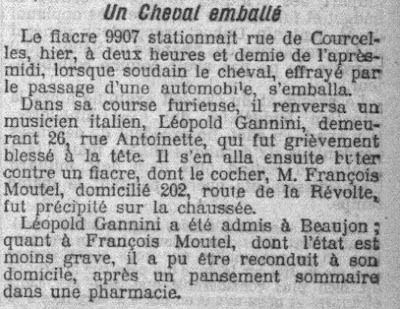 The fiacre knocked over an Italian musician (named here Gannini, but in reality Léopold Giannini, yet another mis-spelling from Le Petit Parisien), then crashed into the back of another fiacre, sending the cabman of that vehicle flying onto the pavement. Giannini received a serious head injury which he apparently survived as he was seemingly still arranging music in the 1920s. The cabman was more fortunate, having a plaster applied in a local pharmacie before being taken back to his home to recover. Reported the same day, another incident showed the kinds of dangers transport users faced at the time. At a little after midnight on the Quai Malaquais near Saint Germain des Près, a packed electric tramway crashed into an equally busy omnibus, injuring seven passengers. 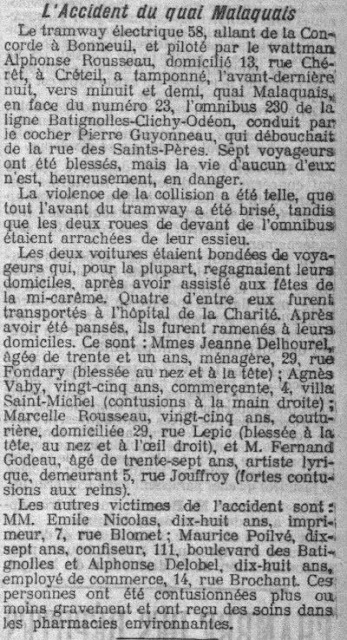 This celebration was also known as the fête des blanchisseuses (launderers) and was primarily an event for young women - which explains why three of the injured in the accident fitted this description. There was Jeanne, 31, who was a housewife, Agnès, 25, a shop worker, and Marcelle, 25, a dressmaker. Alongside them were a printer, a confectioner, a commercial employee and an opera singer! Such accidents were far from rare in Paris, with Le Petit Parisien reporting similar incidents in almost every edition. 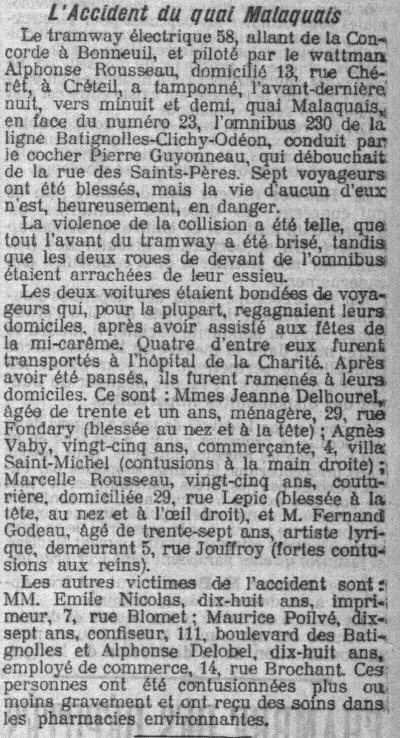 The victims of these accidents all made it home safely in the end, but perhaps they read with interest a news brief that was published in Le Figaro that same day. 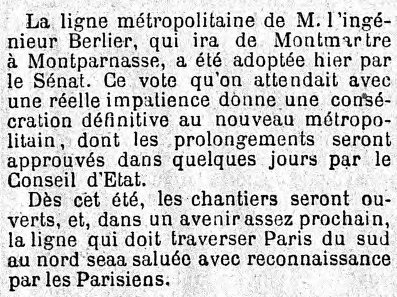 The country's Sénat assembly had the previous day voted in favour of a project for a Metro line linking Montmartre and Montparnasse (today's line 4), the first time the city's left and right banks would be joined together on this system. Work was scheduled to begin that summer, with the hope that this new transport system could finally clear some of the chaos from the city's streets! I love your stuff. Can you imagine how loud the clip-clopping would have been? Probably equal to the scooters whipping around Paris now. Thanks. 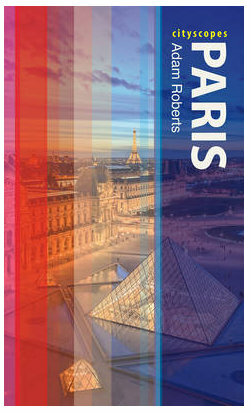 Yes, it would be fantastic to have access also to the historical sounds of Paris - and possibly the smells too! What's also interesting is that the articles always give the precise name and address of the people involved in the accidents. thbz: Yes, this has struck me too. Obviously they had less concern about the protection of personal details at the time, but the journalists must also just have been printing information given out by the police or other authorities. It does help enormously with the research into these stories though! At a flea market, we saw a number of copies of the Petit Journal Illustre. The covers frequently featured dramatic traffic accidents, including one in which a man and child tumble headfirst from the top deck of a tram! Clearly, accidents were relished by journalists and illustrators as fodder for their work. Keep up this wonderful series, I love it!